– Have you ever found yourself wondering how you were going to get to your dream job? – Have you ever found yourself stalled at work and not sure what to do next? – Are you searching for ways to build a more fulfilling and successful career? If any of these apply to you, or you’re looking to take you career to the next level, Trajectory is the answer you have been waiting for. Get your copy of Trajectory today! Every person has a trajectory – this is the path and progression you create for yourself. Trajectory shows you how to own and live your trajectory. 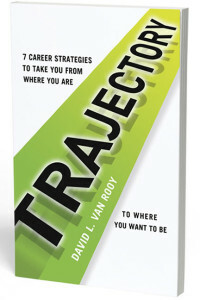 Trajectory is the critical resource you need to manage and grow your career. Every organization has a culture and must decide if that is something it wants to manage intentionally. The companies that choose to do so are more successful in the long run. Just as organizational culture must be managed, you must manage your career; your trajectory. And it is up to you to determine how you manage it. In addition to preparing for today and tomorrow, you must learn to prepare yourself for what comes after what’s next. Trajectory will make it immensely easier for you to do just that. You will learn about timeless strategies that you can draw upon to ensure that you reach your goals and build the career you want. This will help you chart your personal and professional course in an exciting and invigorating way that will give you the guidance and stability you have been looking for, both now and into the future. Author Note: In gratitude for the brave and unselfish service of our military men and women, I will be donating all of the author royalties I receive from the sale of Trajectory to the Institute for Veterans and Military Families (IVMF) in support of our military veterans transitioning into the civilian workforce. IVMFs mission is to enhance American competitiveness and advance the employment situation of veterans and their families by collecting, synthesizing and sharing veteran-employment policy & practices, providing employment related expertise, capacity, training and education and delivering technical assistance to stakeholders in the veterans’ community. You can learn more about this great organization at http://vets.syr.edu. Pick up your copy now from Amazon or B&N.